In my writer's notebook is a sentence by Eric Satie: "The tango is the devil's dance. He does it to cool down." Tango is something I have been thinking about a lot recently. One chapter in my book, The Double Happiness Company, which will be published in January, deals with a ballroom dance instructor who teaches tango. So it was a moment of serendipity when friends from Barcelona gave me tango songs sung by the Spanish flamenco guitarist, Diego El Cigala. It was a most welcome gift because, at the time, I was going through the hard graft of finalising my 95,000 word manuscript for publication. Cigala & Tango, the album they gave me has el duende, that difficult-to-translate Spanish phrase. If someone, or something, has el duende, it gives you chills, moves you, makes you smile or cry. 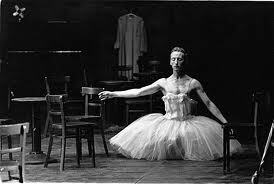 Researching this blog I came across a clip of a ballet created by the late, great Pina Bausch. I have never seen her Bandonéon performed, but I long to now that I have seen this YouTube clip. The filming is jerky and yet, in its own way, is as mesmerising as the choreography. Men and women move out from their line and begin to dance. They move from sedate steps with their partners to sensual hip-grinding combinations that suggest vertical fornication. Meanwhile, upstage behind the couples there is a lone man wearing a romantic tutu. In his long net skirt he repeats the same step over and over: the first step a dancer learns, the humble plié. I don’t know what it is about this repetition that is so moving, that makes it pull at my heart. The simplicity perhaps, the yearning of someone who will never fit in, never know love, but is destined to dance alone, echoing what Bertrand Russell called the ‘terror of cosmic loneliness’.